The Labor Relations Process 10 Edition As recognized arbitration experts around the world, the authors of THE LABOR RELATIONS PROCESS, 10th Edition bring nearly a century of combined experience with the labor movement, labor relations, and collective bargaining to this popular book. 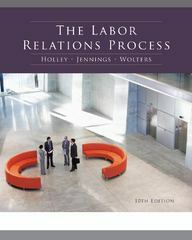 Packed with real-world examples and quotes from practitioners in the field, THE LABOR RELATIONS PROCESS, 10th Edition explores labor's history from inception to current and emerging trends, touching on government, white-collar, and international contexts to give you an unmatched perspective of the topics. Chapters include in-depth analyses of the relationship between management and labor, including key participants in the processes, and the rights and responsibilities of each. Labor agreements, collective bargaining, contract administration, arbitration, and other critical issues and processes highlight the complex nature of organized labor, and introduce you to the wide variety of professional opportunities available in labor relations today.